Several blocks around New York's Times Square were closed to pedestrian and vehicular traffic Saturday night after a police officer saw smoke emanating from a box inside a parked car, according to authorities. Filed under: Times Square Car Bomb • U.S.
Several tornadoes have touched down in northeastern Arkansas, triggering widespread reports of damage, the Cross County Sheriff's Department said Saturday night. There were no immediate reports of injuries or deaths. 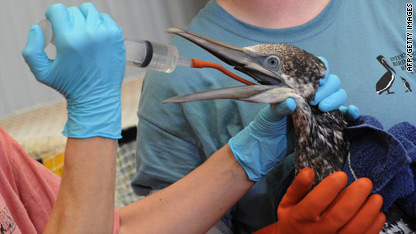 Staff at the Tri-State Bird Rescue & Research in Louisiana hydrate a Northern Gannet bird that was pulled from the oil-filled waters of the Gulf Saturday. [Updated at 11:15 p.m.] As officials and Gulf Coast residents wait for oil from a massive spill to reach land, the slick has already taken a dramatic toll on life all along the Coast, bringing fishing and tourism to a halt in many places and threatening to cripple those industries for weeks to come. Read more on CNN.com. [Updated at 10:57 p.m.] The jovial mood of Saturday's White House Correspondents' Dinner turned somber for a few moments as President Obama addressed the crisis on the Gulf Coast. "Even as we enjoy each others' company tonight, we're also mindful of the incredible struggles of our fellow Americans on the Gulf Coast, both those leading the efforts to stem this crisis and those along the coast whose livelihoods are in jeopardy." [Updated at 9:21 p.m.] Aquariums and animal sanctuaries in several Gulf Coast states are preparing for rescue efforts as the first oil covered animals are being pulled from the contaminated waters. The Suncoast Seabird Sanctuary in Indian Springs, Florida, is seeking donations of rags, brushes and dish soap to assist in cleaning the animals, CNN affiliate Central Florida News 13 reports. Peptol Bismol can also be used to coat birds' stomachs if they ingest oil. Staff at the Aquarium of the Americas in New Orleans, Lousiana, told CNN affiliate WBZR that the spill could not have come at a worse time for the endangered Kemp sea turtle, which was in the midst of migrating across the Gulf to Mexico to nest. WBZR reports that the aquarium is preparing to take in dozens of sea turtles each day and place them in tubs filled with water, kelp and rocks to simulate their natural habitat. The staff told WBZR that regular household supplies like dish detergent and mayonnaise work best to clean their shells, but the hard part is tending to the damaged lungs and liver tissue. [Updated at 6:11 p.m.] Volunteer agencies are mobilizing thousands of people through phone registries and websites to respond to a large mass of oil drifting toward the Gulf Coast. But many people are still awaiting orders, journalist Craig Johnson reports. [Updated at 5:07 p.m.] The Mobile Bay National Estuary Program is gathering contact information here for people who want to volunteer to reduce the impacts of the oil spill. The organization notes that volunteers are not being deployed at this time, but says it will keep volunteers updated. The group also cautions against touching or approaching oiled wildlife, as it may pose health and safety risks to humans and animals. Please contact BP's Oiled Wildlife Response Hotline immediately at 866-557-1401, with information such as the type and number of animals, location, when you saw it and a contact phone number. The Gulf of Mexico Sea Grant Programs is also constantly updating a web page devoted to the spill. Information from the National Oceanic and Atmospheric Administration and satellite imagery from the Louisiana State University Earth Scan Lab’s website are just a few of the resources. [Updated at 4:13 p.m] There's no way to stop oily water from reaching land along the Gulf Coast, but experts will use tools both massive and microscopic to clean it up, reports CNN.com's Jim Kavanagh. He spoke to Ralph Portier, a professor of environmental sciences at Louisiana State University, who said that oil-soaked sand on beaches in the eastern Gulf Coast can be scooped up with heavy equipment, but the grassy marshes in the Mississippi Delta can't be handled that way. Along the Louisiana and Mississippi coast, "you're talking about a sea of grass, if you will," similar to the Florida Everglades, Portier said. "When it gets oiled, if you try and remove some of this stuff, you're going to do more damage than good. "In Gulf Shores, Alabama, and Destin, Florida, you can do that, but not here in what we like to call the Redneck Riviera," the southern Louisiana native said. [Updated at 3:42 p.m.] See what's involved in cleaning up an oil spill, and a list of some of the worst oil spills in U.S. and world history. “This has the potential of being truly devastating." [Updated at 3:14 p.m.] WDSU reports that BP has changed the phone number for its "Vessel of Opportunity" program to 281-366-551. The program was set up to incorporate fishermen and boaters for the oil spill clean-up effort, WDSU reports. [Updated at 2:17 p.m.] CNN.com's Amy Zerba created this gallery of images showing the response to the oil spill. [Updated at 2:10 p.m.] The impact of the oil slick is expected to be felt along the Gulf Coast during the next two days, according to the National Oceanic and Atmospheric Administration. This NOAA graphic shows possible locations of impact through Monday. The graphic was prepared by NOAA on Wednesday. Filed under: Barack Obama • Environment • Gulf Coast Oil Spill • U.S.
As Gulf Coast residents brace for the arrival of a massive oil slick creeping toward shore, local business owners who depend on ocean industries say the spill couldn't have come at a worse time. "The way the economy has been, we were really looking forward to a nice shot in the arm coming up with Memorial Weekend," Brett Dickey, a restaurant owner in Orange Beach, Alabama, told CNN affiliate WEAR. "This could be enough to keep people away if they think they can't get to the beach." The spill and the massive response have already begun wreaking havoc on livelihoods in a region where jobs are largely dependent on seafood and tourism. Douglas Ford, a property manager in Dauphin Beach, Alabama, told CNN affiliate WKRG that he has already been forced to refund customers on condo rentals through mid-June. "We've just passed spring break so the phone has been very active with inquires and availabilities and it just shut down, said Ford, who plans to sue BP and Transocean for his losses, according to WKRG. Stephen Denmark, a city council member in Dauphin Island said Saturday local scientists are predicting that the seafood crop could take a decade to recover from the oil slick. "The last two years have been tough already," Denmark told CNN, referring to the recession. "This will be catastrophic to the mom and pop businesses, which is 90 percent of the business down here on the island." [Update 10:26 p.m.] Faced with "one of the most severe rain events" ever seen in Nashville, Tennessee, the city's Office of Emergency Management has opened an emergency shelter at Lipscomb University, and other locations are being prepared as officials expect more severe flooding overnight and tomorrow. Davidson County residents who have questions or need non-emergency assistance related, including transportation to a shelter, can call a community hotline: 615-862-8574. [Updated 11:30 p.m.] Law enforcement officials on Saturday night were interviewing passengers and crew members aboard a United Airlines flight after a "suspicious message" was found in the plane's lavatory, although the message was later determined to be a hoax. Super Saver, ridden by Calvin Borel, won the 136th running of the Kentucky Derby on Satuday. It was the third Kentucky Derby win in four years for Borel and the first for trainer Todd Pletcher. Super Saver's primary owners are Bill Casner and Kenny Troutt of Kentucky-based WinStar Farm LLC. Louisiana Gov. Bobby Jindal expressed frustration Saturday with efforts to clean up a massive oil spill creeping toward the Gulf coast, highlighting concerns with "BP's ability to respond to this incident." Jindal said he has been working with local officials to develop cleanup contingency plans, but needs funding approval from BP and authorization from the U.S. Coast Guard's incident commander to move forward. "We need to empower our locals on the ground," he said in criticizing the response effort thus far. "The oil that is leaking offshore, the oil that is coming onto our coast threatens more than just our wildlife, our fisheries, our coast, this oil literally threatens our way of life." Police arrested Illinois Rep. Luis Gutierrez at an immigration rally outside the White House on Saturday. Gutierrez, a Democrat, was among a group of protesters arrested by police in front of the White House. The protesters wore T-shirts that read, "ARREST ME NOT MY FAMILY" and "ARREST ME NOT MY FRIENDS." The impact of the oil slick is expected to be felt along the Gulf Coast during the next two days, according to the National Oceanic and Atmospheric Administration. The NOAA graphic above shows possible locations of impact through Monday. The graphic was prepared by NOAA on Wednesday. A “high risk” forecast means there is a 30 percent chance of a tornado forming within a 25 mile radius of the highlighted area. It also means that some of the tornadoes potentially could be EF2 or stronger (they could contain winds measuring more than 110 mph). "High risk" days are rare and typically only issued a few times a year. A NATO-led service member died on Saturday in an "indirect fire" attack in eastern Afghanistan, the NATO-led command said. Indirect fire refers to shooting from a position without a direct line of sight to the target. The service member's nationality and the precise location of the incident were not disclosed. Severe weather is possible Saturday for parts of the southeastern U.S. and the lower Ohio valley, according to the National Weather Service’s Storm Prediction Center. Strong tornadoes, damaging winds and hail are possible, forecasters said. See the latest warnings and watches at NOAA's Web site. Check out the weather in your area. Thousands of Maoist supporters swarmed into Nepal's capital Saturday for a May Day rally that was also intended to press the government to step down. About 15,000 security forces were deployed throughout the capital and businesses were shut in anticipation of violence, but by midday the situation was still peaceful. Twin explosions at a mosque in Somalia's capital on Saturday killed at least 35 people and wounded many more, the African Union's peacekeeping force in the country said. Greek protesters clashed with police who fired tear gas during the annual May Day rally on Saturday in Athens, where thousands of people gathering for the event seethed over government belt-tightening plans to deal with the country's debt problems. The U.S. Embassy warned Americans on Saturday about the possibility of terror attacks in India. President Obama is considering a visit to the oil spill area near the coast of Louisiana as early as Sunday, according to two senior administration officials. Filed under: Gulf Coast Oil Spill • U.S. The FBI has interviewed almost two dozen current and former employees of Massey Energy Co., which owns the West Virginia mine explosion that killed 29 in early April, to determine whether there was criminal negligence in the disaster, a federal law enforcement official told CNN.